You're never too old to rock 'n roll. As long as your definition of "rock 'n roll" also includes things like being a music teacher, recording industry executive, or festival director. Which are all pretty awesome careers, by the way. Sure your high school band might've stalled out after that gig at the local bowling alley, but that doesn't mean you need to stuff your dreams under the bed along with your guitar. Even outside of the music industry, there are loads of jobs that center around music, and you'll find a range of them here. Best of all? They're all hiring right now! 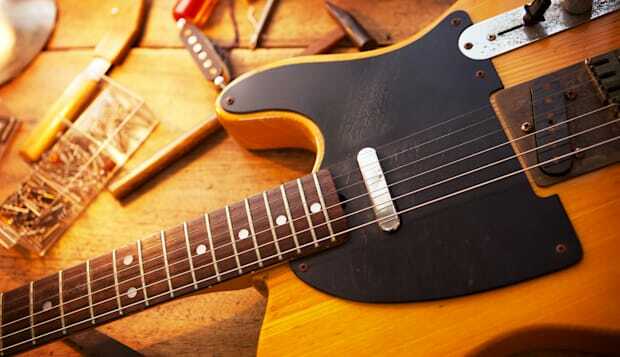 Click through for eight jobs that really rock. Description: Utilize in-house resources to research potential new customers. Contact potential customers by telephone; field incoming inquiries. Maintain ongoing contact with potential customers by phone and mail. Maintain accurate and up-to-date computer records and documentation on all customer data, telephone contact, price quotes and written correspondence. Travel overnight to attend conventions and/ or Festivals. Participate in calling campaigns and other initiatives. Generate sales. Description: If you teach guitar, bass, banjo, mandolin, keyboards, vocals/voice, home production/recording/DJing (Ableton, Studio One, or Reason), we want to hear from you. Candidates should have an understanding of and a passion for teaching. They should also have experience in: reading music (ex: sheet music, tablature), harmony and theory (ex: scales, progressions, techniques). Description: Our Music Content team is made of up real music experts with a deep knowledge of music trends across different genres and regions. Gracenote is looking for a manger with a demonstrated passion for leadership, mentorship and process innovation in the media-technology space, a hands-on, ground-up approach to project management, and a clear commitment to contributing positively to the company and team culture. Applicants must have proven people and project management experience and demonstrate a firm understanding of media technology best practices. A successful candidate will have a track record of leadership, attention to detail and follow-through. Description: The Music Therapist engages in the therapeutic process, using music as the primary modality to enhance the spiritual, physical, emotional and social well being of patients and families. Exemplifies, supports, and promotes the Midwest CareCenter mission, values and service excellence standards. Consistently conducts oneself in a manner that promotes/markets Midwest CareCenter services, in an effort to increase census/business/revenue. Demonstrates responsible stewardship of all Midwest CareCenter resources. Description: Responsible of securing rights for musical material included in programming and projects produced by Univision's media companies. Work closely and communicate regularly with producers to ensure that all the necessary music clearances are requested and processed. Research copyright ownership of songs and their shares. Prepare and submit the music clearance requests to the copyright owners. Record the rights information and track the clearance status of music. Report on a regular basis the clearance status to producers. Description: Sheet Music Plus is creating a new role for a Digital Print Publishing Marketing Manager whose primary responsibility will be to significantly grow our self publishing business through the development of marketing programs, business development relationships and community building effort. Digital Print Publishing is a service that Sheet Music Plus introduced which crowd-sources the development and sale of sheet music arrangements and original compositions. The program enables composers and musicians to upload PDFs of their music for sale on our website. Description: Guitar Center has an amazing educational facility, Guitar Center Lessons, in Coconut Creek and we’re looking for some qualified DJ Instructors to teach at our DJ Spin Lab. The DJ Spin Lab will be held on the third Saturday and Sunday of each month, lasting 3 hours each day. DJ Instructors will need to supply their own gear (digital console, laptop, Serato software). Prospective teachers should also have: A strong academic background. Experience as a private music instructor. Background in rock, pop, blues, and jazz music. Able to teach beginner through advanced skill levels. A professional demeanor. Reliable transportation. A high level of energy and enthusiasm for inspiring others through music. overall annual Budget preparation and quarterly forecasts (P&L, balance sheet & supporting schedules)- including reviewing certain key areas prepared by staff and preparing P&L roll up and reviewing against comparable periods. Quarterly and monthly closes – involves coordination with various shared service groups, review of staffs areas and overall compilation and review of P&L, balance sheet and supporting schedules. Complete understanding of the current accounting requirements for the completion of internal financial statements.